First of all, apologies go out to my Stampers Club gals this evening. Thanks for being so understanding that I was a wee bit of a basketcase, waiting for this evening's results from Convention! Stampin' Up! 's Awards Night was tonight and the 2 hour time difference between MT and ET felt soooo long of a wait. Brent came down to the studio to keep me company -- he's the best (and all mine!). Anyhow, the news finally came in and I'm beyond ecstatic to announce that, for the second year in a row, I placed as the #5 in the "Demonstrator of the Year" category, but as a fabulous bonus I also was awarded the #2 Leadership award for the top Senior Associates in my 1rst level category! That's my GALS who earned that second award, let me tell you -- MWAAHHHHHH! big big smooches to those 17 fabulous women who promoted last year!!! Not only are there cash awards and mementos to be received, but the best news of all is inclusion in the 2009 Founders Circle -- and an all-expenses paid trip in September to St. George, UT for fun, friendship and stamping! This will be my 4th FC trip and I couldn't possibly be any happier in how things worked out. 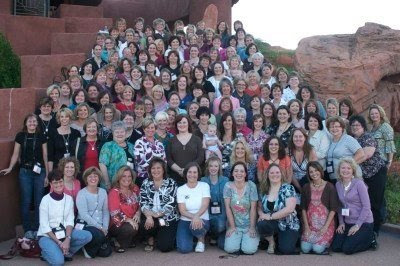 Here 's a picture from last year, all the US and Canadian Founders Circle members together in St George, Utah! Thanks again for ALL you do and help bring to my life -- love you all lots! Wow - Congrats! You make it look so easy but I know how hard you work at this, so celebrate girl!!! Whooo-hoooo! Well done! You work so hard and you deserve this recognition. So proud of you. I let you know last night how happy I was for you, but I'll say it again here: YOU ROCK and you SO deserve this! Congratulations Caroline!! way to go... You work hard at it and you deserve all the results. I am really happy for you. Congrats on your hard work. Way to go Caroline, if anyone deserves that you do. Awesome! congratulations on your achievements with Stampin Up in the past year!! I've always looked forward to seeing what your next post is and the great ideas you post on the blog. On of which was that wonderful stepper box you made for a class back in December last year. I would really like to make one of these for a good friend (and my Stampin Up upline) for her birthday. Would it be possible for you to email me the details of how to make one. It would be much appreciated! !